When Einstein applied his theory to gravitational fields, he derived the "curved space-time continuum" which depicts the dimensions of space and time as a two-dimensional surface where massive objects create valleys and dips in the surface. This aspect of relativity explained the phenomena of light bending around the sun, predicted black holes as well as the Cosmic Microwave Background Radiation (CMB) -- a discovery rendering fundamental anomalies in the classic Steady-State hypothesis. For his work on relativity, the photoelectric effect and blackbody radiation, Einstein received the Nobel Prize in 1921." Here's more....I get it. Do you? The speed of light in a vacuum is the same for all observers, regardless of their relative motion or of the motion of the source of the light. Mass-energy equivalence: E = mc2, energy and mass are equivalent and transmutable. The defining feature of special relativity is the replacement of the Galilean transformations of classical mechanics by the Lorentz transformations. (See Maxwells equations of electromagnetism and introduction to special relativity)." From All About Science: "Probably the most profound scientific advancement resulting from special relativity was the equation of E=mc2 which provided the relationship between mass and energy. This equation led to the development of the atomic bomb." I see Einstiens Theory of Relativity in the attempt at drawing the schoolbus in motion, the sun, the light rays bouncing off of it. I see Einsteins theory by Jack as Zodiac using the word photoelectric in diagram, how when the sun at a certain time, that clocks tick slower in motion (schoolbus moving up the hill), that time, after the earth has rotated will set mass off in motion. There's more to see in the diagram. I see it, I get it. Dennis asked me once, if Jack, who'd according to him joked about Einsteins Theory of Relativity ("Its all relative"), had taken over my soul but LOL, maybe it's Einstein! I see watching PBS all these years and feeding my brain with documentaries on such people has paid off! IMO, from my perspective, Jack Tarrance was very, intelligent and this is among reasons why he wasn't caught as most detectives, people in LE just aren't at that level, so, they didn't see the evidence. They didn't see that Jack Tarrance was the bomb living in the schoolbus c1969. "Dave Toschi & Other Lead Zodiac Killer Dets. Dumb-As-A-Rock? Bus Bomb Letter Einstein Level Science" They weren't at Jacks level, they never saw him coming! AEN: phase of a Neutron Star (I believe that's decay mode Alpha Epsilon Nu) ; Constellation Taurus has 3 noted things: 2 groups of stars and the Crab Nebula thus the 3 Tau symbols in a circle; K is for Kelvin Degrees and stars heat are measured in Kelvin Degrees; M is for Magnitude of a star (need to find the key star brightest Magnitude seen in a Constellation to ID it); the crosshairs of the Bubble Sextant used by Celestial Navigators esp, Air Force Flight Navigators; Aries symbol (to find Taurus, should locate Aries first? ); NAM is Neutron Absorbing Material usually a Black Hole which is where Time is altered and is a process happening in the Crab Nebula. I see Einstiens Theory of Relativity in the attempt at drawing the schoolbus in motion, the sun, the light rays bouncing off of it. I see Einsteins theory by Jack as Zodiac using the word photoelectric in diagram, how when the sun at a certain time, that clocks tick slower in motion (schoolbus moving up the hill), that time, after the earth has rotated will set mass off in motion. There's more, though, when moving up hill, especially by mechanized force, you are creating negative or dark energy and if at the top of the hill, take foot off the gas pedal, positive energy takes over and it will go down the hill on its own. Zodiac Killer, who is said to be ID'd as Jack Tarrance used A & B on the diagram. In the cipher, there's Constellation Taurus which has the Crab Nebula in-turn Negative energy in the Black Hole and AEN, NAM, the K for Kelvin Degrees, M for Magnitude...well, all of which is basically the forces in Atomic Energy that went into the Atomic Bomb put onto the earth that 1945. That bomb went off with human manufactured negative energy force never seen before on earth. When the Atomic Bomb test went off in New Mexico, it was an artificial sunrise on the horizon before the natural one and when the Atomic Bombs were to go off in Japan, 8/9/45 Plan B Nagasaki was chosen because it was too cloudy to make precision drop, so, bomb didn't go off for plan A Kokura. Clouds got in the way of the sunlight. So, Jack was alledged to be stoned off his rear when creating these Zodiac compositions, non-the-less if you understand the slightest about Einstein, his Theory that was applied to Atomic bomb, you'd see the influences in this particular Zodiac Killer communication from April 1970. In the Bus Bomb diagram, the bus A to B is moving upwards. Clocks tick slower or time dilation appears to happen to the observer when moving up. Time dilation is in Black Holes, like the Crab Nebula. When positive energy pulls downward, clocks may appear to move/tick faster. In the Atomic bombings of Japan they used batteries to stabilize the timers when in free fall towards the earth. There is so much Einstein influence shown in the Bus Bomb letter with the Cipher, it's unbelievable. If LE just allowed Jack Tarrance to be a suspect focused on just a decade earlier, it would have been solved years ago. If they just focused on ASTRONOMY and not Astrology they would have gotten what I, a woman, have got and I am, when it comes down to it, an Amateur unpaid Sleuth, who's a Caregiver and does this in my spare time. It's been summized alot lately that people didn't want the Zodiac Killer solved so they can get their manuscripts sold, movies, sites, etc. which does appear to be mostly true. But with what I see recently maybe it's largely because detectives like Dave Toschi and so many other guys on the Investigative trails into Zodiac Killer were as Dumb-As-A-Rock. IMO, they need more women with sharp investigative skills in LE but most men just can't handle a brainy chick. We women, when it comes down to it, quietly rule the world, as we can give birth to the next great leader, and raise families, while working even if our work is just in a vineyard picking grapes and go do tripple duty of kids, work, education getting our phDs while at the bottom to rise to the top. Jack Tarrance was truly trying to say he was the TIME bomb living in the schoolbus as he was affected by Einstein, was as smart as he was and affected by the never seen before on earth Atomic events of 1945 which brought down the force of what's in Constellation Taurus, which is in the heavens above when both he and his mom were born, onto the earth. I never felt so smart until these Zodiac cases with Jack Tarrance, the Celestial Navigator who's Step-Dad was also a Celestial Navigator, as the real and right suspect! That's just so true, I think! Let's explore this more. This could bring closure, so let's do it. I've been an Electronic Technician officially for more than 39 years now. That diagram is pretty simply, as a matter of fact the way it's shown.... a truck could trigger the bomb. It's more of a "block diagram" than a "wire to wire schematic" or "wiring diagram", the photo switches would require more connections to make that circuit work at all. To start citing Einstein's theory of relativity with regards to this circuit is pure nonsense. In my view its a sideshow laced with leaps in logic, with no credible foundation, typical catseye. cateyes' posts made sense when she first arrived here but later on she went off on a tangent so to speak. While there may be some truths in what she's posted the whole business is misleading. Nanette, the whole thread just seems way out there. I don't doubt that she's made some connections here and there but it comes off as nonsense in it's totality, I don't mean to be mean, I'm interested in this board being and staying credible. I know JT is the Zodiac etc and so do you but this board needs to cultivate credibility. I think that both of us are getting to the point where we get fed up with mayhem, drama, discord etc and I feel bad about that but I say it again the keyword is credibility. As you know there are some people trying hard to discredit this whole thing. I think they are trying hard because it's struck a nerve with some folks otherwise they'd simply ignore us. I do think there could be something to this Einstein thing. I mean catseye identifies a lot of connections there. Photoelectric, mass, time etc. etc. Yeah sure green-green, in a pigs eye, green-green was just another troll. TerryB... I could not agree with you more regarding the (schematic diagram???). I have also been involved in the electronics field going on 40 years. I agree with you when describing this as more of a block diagram, than a true schematic. The most valuable aspect of this diagram is, to compare the way this person drew this diagram, and one other bomb diagram drawn by the Zodiac and, compare these drawings to drawings that Jack was known to have drawn. In my opinion, the style is nearly identical. Just my humble opinion though. Take care. trustno1, that's a good point that you make that it compares to Jacks other drawings. I was more than irked by this thread because again catseye was reading way too much into the whole thing. I think you would probably also agree that it's a relatively crude concept because if it was properly wired as needed based on this block diagram then a truck could have triggered it. Furthermore the author doesn't even spell the word switch right which demonstrates his careless ignorance, yet he's supposed to be versed on Einstein's theories. I agree TerryB...When this person drew this extremely crude diagram, I would almost be willing to bet money, that the last thing on his mind was how he could get Einstein's theory of relativity to factor into the operation of this device. I also noticed greengreen pointed out the term "photoelectric" could be another link to the Einstein connection. We both know that photoelectric is more/or/less a term used to describe an electronic component that uses light to activate some sort of function in the circuit that the component is wired in to. 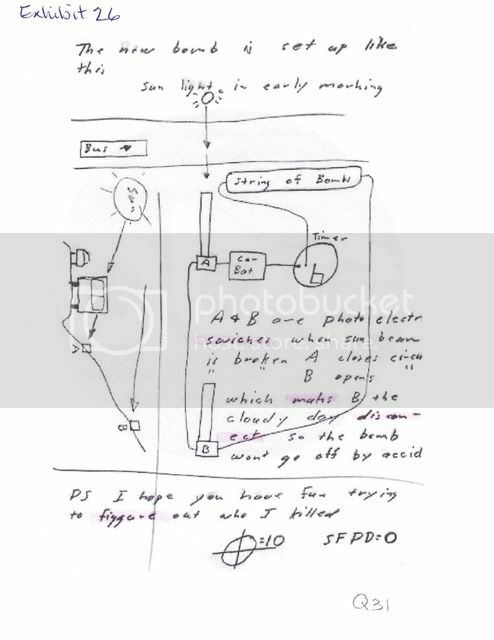 If I recall, the other bomb diagram the Zodiac drew, used some sort of mirror, or other reflective device aimed at a photocell, or a flashlight aimed at a parabolic mirror that was then aimed towards the photocell. I can't remember right now but, it was something like that. I didn't think that in 1969, they would have been able to make mirrors to reflect a coherent beam of light very small. The size of the mirror needed would not have been easy to conceal in the weeds. I'm gonna quit rambling for now and hollar back in here later. Take care. I'm trying to remain objective here but really?? Uhmm, nanette the thread title is the theory of relativity. That's where it was mentioned. This is a perfect example of nanette trying to obfuscate the issues. I got the impression she was just a fame whore, like catseye. It's hard for me to defend you on this one Nanette because of post #16, I did try to warn you (Nanette) about catseye's nonsense.